Create your own lip balm gift set! Mix and match any two of our lip balms or cuticle balm -- they all glide on smoothly and leave your lips or cuticles feeling soft and moisturized. Our vegan lip balm set makes for a perfect gift for yourself or someone special! You can use the handy dandy drop down menu to the right, or let me know your two selections in the notes to seller at checkout. 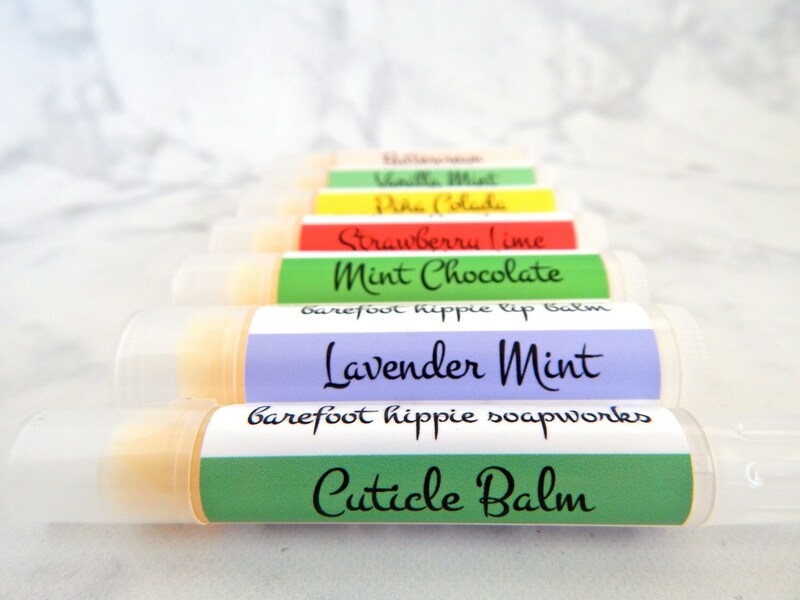 The purchase of this listing is for any two tubes of vegan lip balm or cuticle balm. For more information about each balm, please see their individual listings in our shop. Lip balm - Our vegan lip balm glides on smooth and has great staying power. We've taken some of our lip balm to the Austin City Limits festival. It didn’t melt after being out in the hot Texas sun all weekend, so it should hold up well in your pocket too. Enjoy! Cuticle balm - Our creamy cuticle balm is made with skin-loving avocado oil, shea butter, and jojoba oil. Just swipe onto cuticles and massage in. Use after a manicure or whenever your cuticles need a little bit of extra pampering.